Catherine II, Empress of all the Russians, is known as one of the most powerful and hard working people in history. Many writers and historians have not always been sympathetic to her regarding her private life and have overlooked her achievements when ruling Russia. 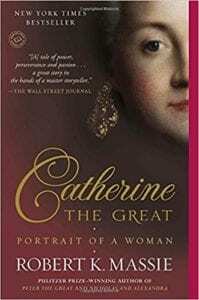 In contrast, Mr. Massie has written a stellar biography of Catherine that tells the reader what an accomplished and remarkable woman she became. Catherine was born in Stettin, in 1729. Stettin was then Germany and is now Poland. Her father was Prince Christian Augustus of Anhalt-Zerbst, a prince of a lesser-known family among the many principalities in Germany. Her mother, Princess Johanna of Holstein-Gottorp, was much younger than the Prince but was from a much higher-ranked family. She was given the name: Sophia Augusta Frederika of Anhalt-Zerbst. After Sophia was born, her mother became bored with the provincial life of Stettin, where her husband was a high ranking officer in the Prussian Army. As Johanna was related to many noble families in Germany, she took every opportunity to travel to the courts of Zerbst, Hamburg, Brunswick, Kiel and even Berlin. Many years before this, Johanna's brother Prince Karl August of Holstein-Gottorp had gone to Russia to marry the Princess Elizabeth Petrovna, daughter of Peter the Great. Before the wedding took place, the Prince died of small pox, leaving Elizabeth heart-broken. Elizabeth's nephew, son of her sister Anna, came to St. Petersburg when his parents died at Elizabeth's behest and was named as the heir to the throne of Russia as his mother and Aunt were daughters of Peter the Great of Russia. In November of the year 1741, Princess Elizabeth seized the throne with the help of the Imperial Guards, formally declaring her nephew Peter Ulrich of Holstein-Gottorp the heir to the throne. When she brought him to St. Petersburg she changed his name to Grand Duke Peter Fedorovich, the future Tzar Peter III. Peter was now 14 years old and it was time to look for a bride for him. Elizabeth remembered fondly the family of Karl August, whom she had been engaged to marry and invited the Princess Johanna, sister of her deceased fiance and the Princess Sophia to come to St. Petersberg to meet the heir to the throne and plan a wedding between the two young people. Sophia's name was changed to Catherine II and she went on to marry the future Peter III. She was treated badly by Peter and looked for companionship elsewhere with young men of the court. Her favorite companion was Gregory Potempkin by whom, it was said, she had her child Paul, who became heir to the throne. While she was Empress, she dealt with the many trials and tribulations of her country and looked after the welfare of the Russian people. She was praised by many and, as usual, condemned by some - and the author has remarked on all of her triumphs and failures. Her family, friends, enemies, lovers, etc. are all told about in abundance, including her mother, forever making plans that made her look good, and her husband who had nothing to do with her, ignoring her most of the time. This story is grand and glorious as are Robert Massie's previous works: (Nicholas and Alexandra and Peter the Great: His Life and World). The story is accurate, the characters very true to life, with much style and detail. Quill Says: For readers of history, this is a gem. A life story of an extraordinary woman which is very rich in color and drama.